The term “tonewood” generally refers to any wood which may be used in the construction of a musical instrument, specifically string instruments. An intrinsic characteristic of these instruments is the use of a resonant chamber, or sound-box, which not only projects the sound of the instrument but provides personality and quality to the overall sound of the instrument depending on its size, architecture and different kinds of wood used in its elaboration. This piece explores the internal resonances of each instrument and the way these correlate with the external performance space. For this, each instrument is continuously “scanned” through a series of impulses, exciting several resonant modes and projecting different overtones resulting in complex harmonic relationships. Very minimal material is diffused through the transducers: just a pulse repeated every 80 ms and a sine wave of 659 Hz (pitch e). These are generated by the music software Max. To scan their instruments, the musicians follow a score in which three different aspects are notated. First of all, the volume of the sound is diffused by the transducer (the volume of the 80 ms clicks or the 659 Hz). They control this with a volume pedal. The second aspect is the amount of pressure the player uses to push the transducer against the instrument: low pressure, normal pressure, and overpressure are the indications mentioned in the score. 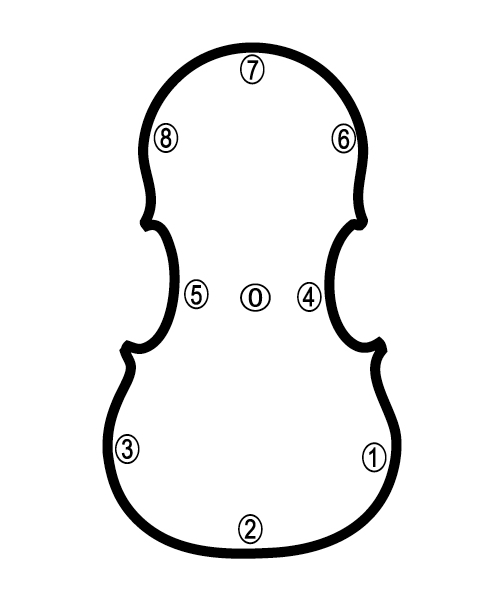 The last aspect is the placement of the transducer on the instrument, which is indicated by 4 (Tonewood I) or 9 (Tonewood II) numbers. This piece is not played on the strings of the instruments and neither fingers nor bow movements produce the sounds. For this reason, the five musicians playing this piece turn their instruments around. 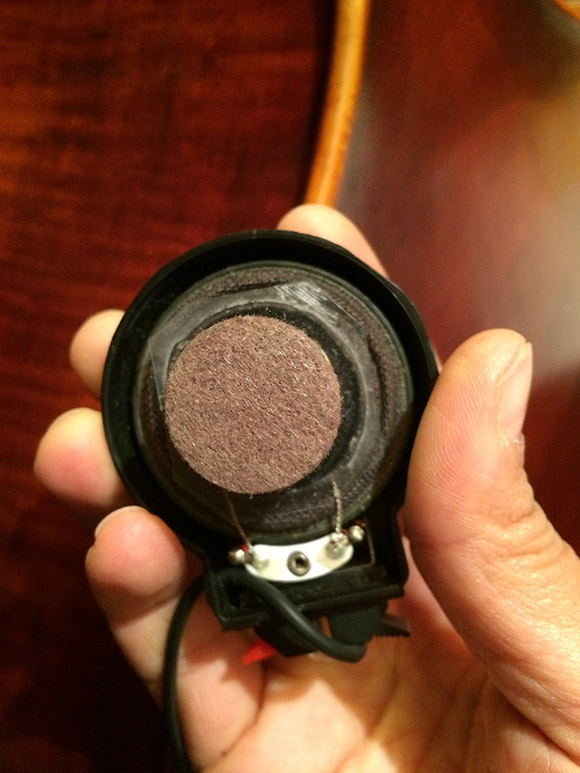 This allows them to more easily access the soundboard of their string instruments. 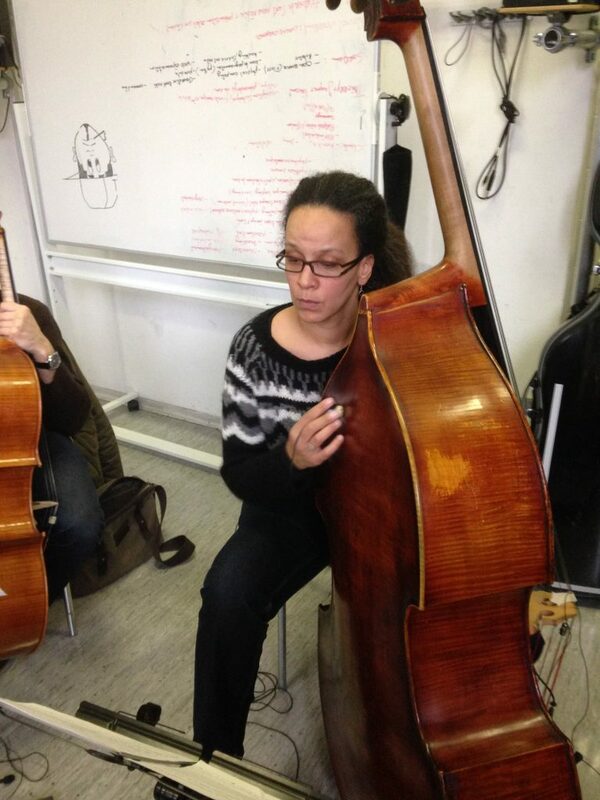 Double bass player Jocelyn Rudasigwa during a rehearsal of Ensemble Vortex: she has turned her double bass around and is scanning her instrument with a transducer. 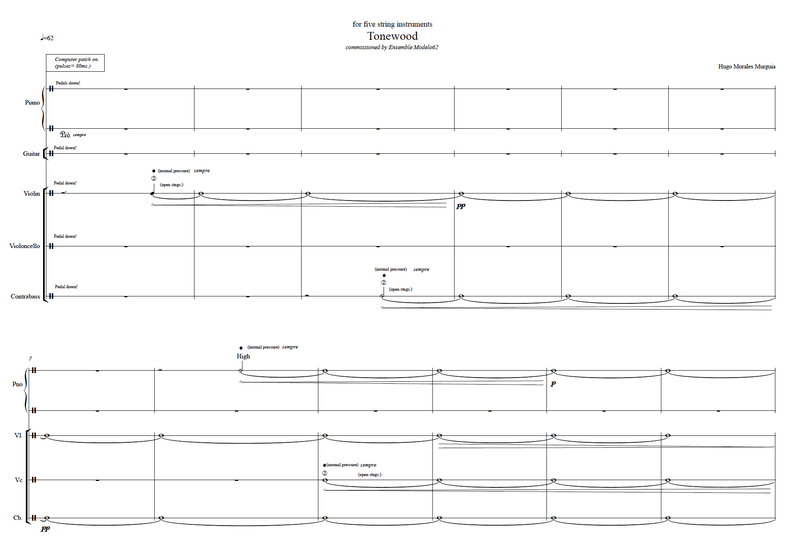 This is a video documentation of Tonewood I performed by ensemble Modelo 62. Just having the same pulse repeated until almost the very end of the piece opens your ears to a miniature world of sonic changes, all caused by the resonating bodies of the instruments themselves. The system of Hugo’s reminds me a little bit of Ute Wassermann’s Windy Gong, for which she uses a loudspeaker with a cork placed on top. 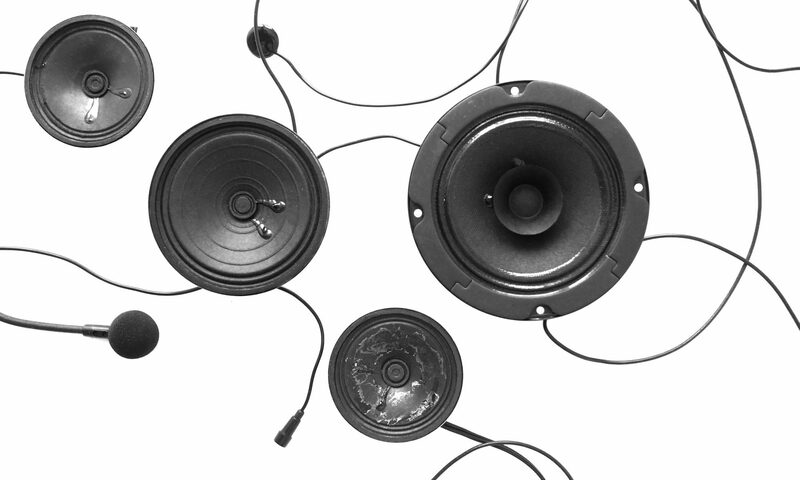 And indeed: Hugo confirmed to me that he had been influenced by Wassermann’s loudspeaker after reading about it in Nicolas Collin‘s great book Handmade Electronic Music. This, by the way, is an indispensable book not only for those interested in hardware hacking in general, but also for several hands-on microphone and loudspeaker technologies. Chapters such as “How to make a contact mike”, “The celebrated jumping speaker of bowers county”, and “Turn your tiny wall into a speaker” are great sources of inspiration. Tone wood II is going to be performed on the 30th of March in Geneva, so if you are close by, you can attend the concert by Ensemble Vortex during the Archipel Festival.